Europe – a continent packed with everything from snowy mountains, to small sleepy towns, to bustling big cities, to stunning beaches. It’s difficult to describe Europe in a few words or to experience it fully by just visiting one of its countries. The second smallest continent in the world has a lot to offer. Literature has been written about it, its beauty has been captured in a variety of films and legends have been born here. Wouldn’t you like to visit Europe and experience it for yourself? To do that, you need one visa. One visa that will unlock multiple countries, multiple experiences, multiple cultures and more. It’s called a Schengen visa. Now, before you book your tickets, you’ll have questions about the Schengen visa application, Schengen countries, Schengen visa requirements and more. Here we’ve put together a list of the common questions people ask when applying for a Schengen visa. Check it out and see if we’ve answered all of yours! A Schengen visa allows you to visit all 26 countries in the Schengen area. This means that you won’t need to apply for an individual visa for each country. You can explore these amazing countries for 90 days, over a 180-day period. Which countries fall under the Schengen region? The Schengen agreement was signed in 1985, by five members of the European Economic Community. Now, almost 33 years later the list has expanded to 26 countries. So, before you book your tickets and plan your trip, take a look at the list below and decide which countries you’d like to visit. The Schengen visa makes it possible! Am I eligible for a Schengen visa? Indian citizens are eligible to apply for a Schengen visa and can apply at any embassy of the 26-member nations of the Schengen agreement. You can visit the Thomas Cook, to get the accurate quote for your Schengen visa. We’ll also give you the option to pay for your visa via net banking/credit card/debit card before we start to guide you on the visa application process. What kind of documents do I need to keep ready for the visa? Which embassy should I apply to for my visa? The Schengen visa can seem complicated as it represents an entry to 26 different countries. Luckily, the application process is incredibly straightforward. Your Schengen visa should be issued by the country where you’ll spend the majority of your trip. If your trip is divided equally across the countries you intend to visit, then you can apply for a visa from the country you plan to enter first. Once you’ve planned your trip, you can decide accordingly and apply. How long does a Schengen visa take? Based on general EU guidelines, your Schengen visa should take 2 weeks to process. However, if you want to be on the safe side, it’s better to apply 30-60 days in advance. That way, you have more than enough time to anticipate your trip instead of worrying up until the last minute. The extra time also allows the consulate or embassy to review your application and ask for any additional information or documentation if it is required. You cannot apply for a Schengen visa any earlier than 3 months before your departure date. When you apply for a visa with Thomas Cook, not only do we guide you through the entire process, we also provide real-time updates on your visa application status. What is the difference between single entry and multiple entry Schengen visa? With a single-entry visa, you can visit the Schengen region only once and you will not be allowed to re-enter once you have departed. A multiple-entry Schengen visa allows you to enter the Schengen area multiple times within the visa’s validity of 90 days, over a time period of 6 months. The multiple entry Schengen visa’s validitiy can go up to 3-5 years. Under what circumstances can you extend a Schengen visa? What if my Schengen visa application gets rejected? If your Schengen visa application is rejected, don’t lose hope! You can always apply to a different embassy for a Schengen visa. For instance, if your visa application was rejected by the French embassy, you can always apply for a visa through the Italian embassy. Each time you apply for a visa, it is viewed as a fresh application. What are some of the reasons my Schengen visa could get rejected? There are 6 common reasons why your Schengen visa could get rejected. This is where we come in. When you apply for a Schengen visa online with Thomas Cook, you will be guided step by step regarding your documents, your application, and other requirements. This way, we’ll notify if there is anything that needs to be changed or rectified on your visa application. Do I need to attend an interview for a Schengen visa? Once you have submitted your documents and applied for your Schengen visa, you will need to meet with consular officials and answer questions pertaining to your trip to Europe. What is the embassy looking for during a Schengen visa interview? The questions in a Schengen visa do not just range around the documents and application details that you have provided. Here, the interviewer may ask you more personal questions, such as your reasons for the trip, whether you have friends and family in the Schengen region, your intentions to return to your home country, your marital status and more. The job of the interview is to look for signs of hesitation or unwillingness to explain your reasons. However, as long as you stay focused, calm and are completely forthcoming about your reasons for visiting the continent, there’s really no need to feel stressed or hassled about the visa interview. 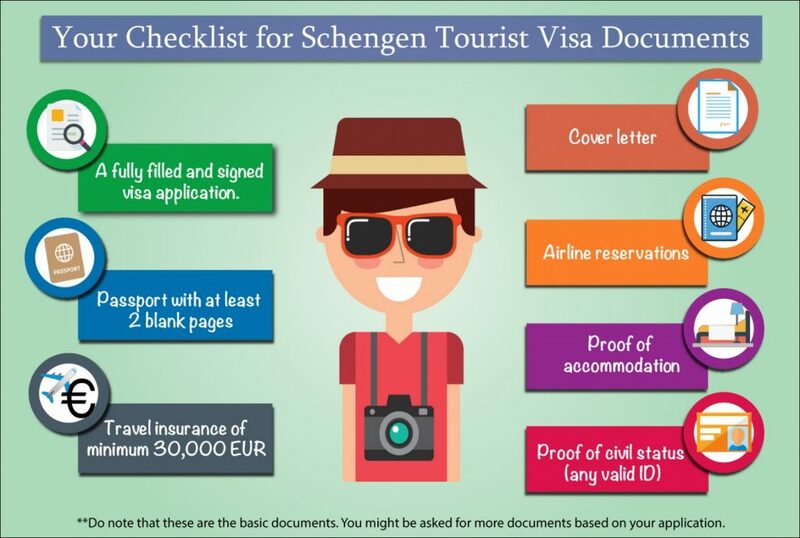 What documents should I carry while visiting a Schengen country? When you’re travelling across countries in the Schengen region, you’ll need to carry your passport and visa. Your passport needs to be valid for at least 3-6 months and was issued in the last 10 years. However, when you’re crossing borders of countries, border officials might request additional documents. You may need to provide an invitation letter, proof of accommodation and your return or round-trip ticket. You can contact the local consular services of the EU countries you are visiting to find out the precise list of documents. You can also carry your travel, health or car insurance documents, in case they are required.